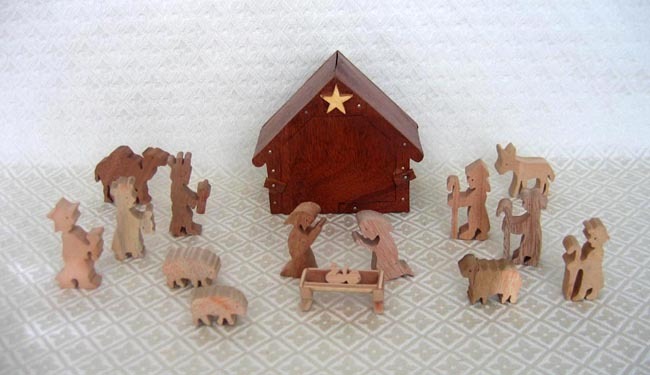 This wooden Nativity was produced by Baptist pastors who worked at a wood shop called “Pedal Powered Projects” in Mali. The name's origin came because all of the shop equipment (such as band saws) was run by pedaling (no electricity!). Often these pastors are bi-vocational, meaning they have to work a second job for income, so this project was created by missionaries to help pastors learn a trade and earn some extra income. Since 1983, Pedal Powered Projects has created unique wooden products without the aid of electricity in the predominantly Muslim country of Mali. The ministry uses bicycle-type jigsaws, lathes, etc. to cut out items from used crates. Today, there are three workshops and 15 men who produce the items. There are 15 pieces in this set (including the stable). All of the pieces fit inside the stable provided the large ones are placed first. The height of the stable is approximately 5 inches. The tallest figure is about 2.5 inches tall.